Jean-Paul Riopelle was an active member, and equally one of the best known, of the Paris Lyrical Abstraction movement which developed from 1945 and which, through ‘peinture informelle’, became well known with the work of Wols, Hartung, Soulages, Schneider and Mathieu. From childhood onwards, Riopelle showed a marked taste for art, taking private lessons with Henri Bisson, the drawing teacher at his school in the Sainte-Marie district of Montreal. He drew constantly although he was also meant to be studying his other school subjects. His first figurative landscapes date from 1938 to 1940, when he was a student at the École Polytechnique de Montréal. Riopelle’s entire future work is ”marked with the seal of a continent where everything is as immense as the sea: corn, snow and above all the forest,” wrote Pierre Schneider (L’œil, June 1956). Between 1943 and 1945 he attended the École des Beaux-Arts de Montréal, showed at the official salon and above all attended the École du Meuble, the equivalent of the École Boulle, where he was taught by the architect Parisot, Maurice Gagnon and the painter Paul-Emile Borduas, who inspired the young Quebec artists and to whom he revealed the ideas of the surrealists. In 1945 Riopelle clashed with his parents’ refusal to allow him to pursue an artistic career. Without financial resources, he went through 10 years of extreme material precariousness. With his friends Mousseau, Barbeau, Leduc and Fauteux, he met in a hangar where the future group the ‘Automatistes’ was born, holding their first exhibition in Montreal in 1947, with Borduas. Riopelle sailed for France as a groom on board a cargo ship which was transporting horses. In Paris he visited the Louvre, and at the Musée du Luxembourg saw the works which had been stolen by Goering. “I decided that it was in the Île-de-France, where the light is the most beautiful, that I would live,” he confided (catalogue Retrospective, Paris, 1981). After a brief return to Canada, with a visit to New York where he met Hayter, who introduced him to Miró and Lipchitz, and where he discovered that other painters painted and thought as he did, he returned to live in Paris. He worked in the attic of the Hôtel Monsieur-le-Prince, where Rimbault had lived. In the same year Riopelle showed at the Salon des Surindépendants. The following year he continued to meet a large number of people, including Aimé Césaire, Hérold and Picabia. He made friends with Georges Duthuit, who was highly considered by Breton. The son-in-law and defender of Matisse, a poet and an aesthetician, Duthuit was one of the first to defend de Staël, Bram Van Velde, Sam Francis and Riopelle, through whom he met Samuel Beckett. In August 1948 Borduas’s manifesto Refus Global came out, which officialised the Automatistes group. Riopelle was a co-signatory. This message of revolt aspired to great purity and proposed new modes of thought. “We should step aside for magic, for mysterious objectives and for love,” we can read, for instance. For Riopelle this regeneration included the impetus of the gesture suitable for provoking the primordial forces of nature. He showed for the first time at the Salon de Mai, in which he participated regularly from 1957 onwards. In 1949 Riopelle had his first solo exhibition at the Galerie Nina Dausset, the owner of which whom he had met the previous year and whose gallery was a meeting place for the surrealists: “Everyone went to Saint-Germain-des-Prés then. Nobody went to Montparnasse, that was 1930.” The catalogue was signed by André Breton, Elisa and Benjamin Péret. Riopelle had abandoned all figurative references, developing a lyrical and abstract language based on the spontaneity of the gesture. While for Pollock the painting’s texture was at the centre of the subject, Riopelle intended to control the pulsions of his gesturality, contrary to the American painting with its ‘dripping’, in his desire to transpose his impressions of the tangible world through an informal automatism from which nature is never absent. “The paintings of the period 1949–1953 are the episodes of this unprecedented transformation. Glimpsed first through the loose or torn netting of the writings, it enlarges, becomes denser, closer, overflows finally… the pigments, numerous and undiluted beat down on the canvas in harmonious showers which answer to no known chromatic system,” wrote Pierre Schneider in his preface to the Riopelle retrospective at the Musée National d’Art Moderne in Paris in 1981. The pure colour, applied straight from the tube in thick blobs or worked with a knife, structures more or less rectangular forms in the manner of a mosaic, evoking the endless spaces of his country of origin. At the same period he met de Staël and became friends with Serge Charchoune: “We lived on the fringes in Paris as we would have done anywhere. But we had contacts with people who also wanted to explode. Paris offered a way of survival” (op. cit.). In 1950 he exhibited at the Galerie Raymond Creuze. From this period onwards Riopelle was part of the avant-garde movement of informal art. In 1951 he was again invited by Mathieu to participate in a group exhibition at the Galerie Nina Dausset, under the title Véhémences confrontées (Bryen, Capogrossi, de Kooning, Hartung, Pollock, Riopelle, Russel, Wols and Mathieu), with a poster-manifesto by Mathieu. In November that year Michel Tapié organised an exhibition of six artists (three figurative and three non-figurative) under the title Signifiants de l’informel at the Studio Paul Facchetti: Fautrier, Dubuffet, Michaux, Mathieu, Riopelle and Serpan. In June 1952 Tapié organised an exhibition of eight lyrical abstract artists in the same gallery: Bryen, Donati, Gillet, Philippe Martin, Mathieu, Pollock, Riopelle and Serpan, an exhibition immediately followed by that held for the publication of his book Un Art autre, in which a work by Riopelle is reproduced. In 1952 he also exhibited some works at the Galerie Henriette Niépce alongside sculptures by Isabelle Waldberg. He had a first studio in Montmartre in rue Duranteau, in the same building in which the first performance of François Poulenc’s work Les mamelles de Tirésias (1917) had been given. Exhibitions of this avant-garde group were held abroad: in 1953 with Opposing Forces at the Institute of Contemporary Arts, London (Sam Francis, Mathieu, Michaux, Ossorio, Pollock, Riopelle and Serpan); and in 1955 with Tendances actuelles (3rd exhibition) at the Kunsthalle in Bern, which aimed to show the most significant personalities of lyrical abstraction that had begun to be confused with tachism: Bryen, Mathieu, Michaux, Riopelle and Wols. Riopelle also participated in more fragmented exhibitions which brought together all the representatives of ‘abstraction libre’: Young Painters of the École de Paris, Edinburgh and Glasgow (1952), Malerci in Paris Heute Kunsthaus, Zurich (1952), Younger European Painters, Guggenheim Museum, New York (1953), and then in 1954 throughout the USA. In 1953 Riopelle exhibited at the Galerie Pierre, which held a joint exhibition with the Galerie Craven located opposite. Pierre Loeb wrote a text for the catalogue in which he mentioned his visit to the painter’s studio “spattered with colour… there are rows of paint pots in front of the canvas… colours mysteriously mixed in a disturbing alchemy or employed in their pure state, become sky, rock, earth, blood, air, leaf, crystal.” At this time the dealer was buying all his work, later reduced to half. He crossed Spain on a motorcycle, a trip that lasted several weeks. 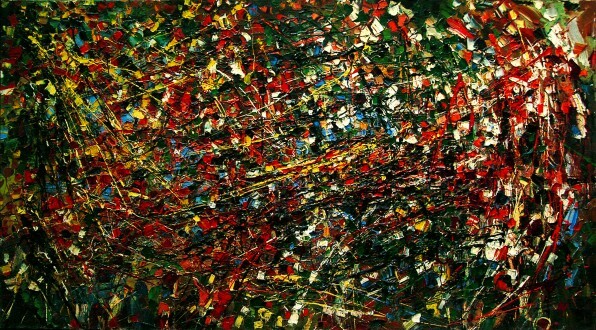 From 1954 Riopelle showed regularly at the Pierre Matisse Gallery in New York. In 1954 an exhibition of his work was held in Paris at the Galerie Rive Droite, prefaced by Georges Duthuit. He participated in the 1954 Venice Biennial at which he represented Canada, and the following year in the São Paulo Biennial at which he received an award. He travelled in the United States, made friends with Francis Kline and met Pollock, whose work he had only got to know around 1949 through photographs in the review Life. In 1956 solo exhibitions were held at the Galerie Jacques Dubourg (Jacques Dubourg became his dealer after the death of Nicolas de Staël), with a catalogue preface by Pierre Schneider and at Gimpel Fils in London. In 1958 there was an exhibition at the Kestner-Gesellschaft in Hanover with a text written by W. Schmalenbach. In 1959 his paintings of 1949 to 1959 were shown at Arthur Tooth & Sons in London. In 1960 the Galerie Kléber, which was run by Jean Fournier, and the Galerie Dubourg (with a text by Pierre Schneider), in 1964 the Galerie Jean Fournier showed Au-delà du 120 (large works). From 1966 Riopelle exhibited regularly at the Galerie Maeght in Paris. His reputation permitted him to participate in numerous group exhibitions in Europe, the USA, Canada and Japan. In Paris he showed at the Galerie Creuze-Balzac in 1957 with 50 ans de Peinture abstraite for the launch of the Dictionnaire de la Peinture abstraite by Michel Seuphor, who in it referred to Riopelle’s work as ‘aerial impressionism’. He was invited to participate in L’École de Paris at the Galerie Charpentier in 1956, 1957 and 1958. He was awarded the Unesco Prize at the Venice Biennial in 1962. In 1967 a retrospective of his work was held at the Musée du Québec (catalogue). He began to pay more and more frequent visits to Canada where, in 1974, he built a studio at Sainte-Marguerite which he used along with a second studio at Saint-Cyr-en-Arthies. For many years he had made sculptures, but he had to wait until 1958 to be able to cast his bronzes, which he showed for the first time in 1962 at the Galerie Dubourg. He worked with clay and wax with the same impetus as his painting. In his painting he had renewed his techniques and mediums. In 1967 he made collage-assemblages using ‘waste’ from prints. Abandoning a fragmented dynamic texture in which the mixed colours were underlined by straight lines, he introduced a new language open to figuration (Hiboux series, 1970). Riopelle continued to express a “mental landscape, the result of his relations with reality,” he explained. “Because there are no longer any widely accepted symbols, another type of relationship is necessary. For me, this is the contact with nature. The contact with nature requires documentation… for me, to create, the simplest is to draw and to gather material from nature” (op. cit). 1981 Peintures 1946–1977. Musée National d’Art Moderne. Centre Georges Pompidou, Paris. Catalogue, preface by Pierre Schneider. Biography, bibliography. Retrospective held in Quebec and Montreal (1982). Museums: Paris National Art Moderne – Fondation Maeght, St-Paul-de-Vence – New York – London – Basel – Cologne – Montreal – Quebec. Pierre Restany: Riopelle, Cimaise, August 1956. Guy Robert: Riopelle ou la poétique du geste, de l’Homme, Montreal, 1970. Pierre Schneider: Riopelle, Maeght, 1972.